Asbestos is a potentially hazardous mineral, which if handled incorrectly can release fibres that can damage the lungs. If sufficient fibres are breathed in, exposure to asbestos fibres can cause lung disease (e.g. asbestosis and possibly cancer). Therefore, the use and management of asbestos needs to be controlled. Asbestos has been used for many thermal and acoustic insulation purposes in buildings and industry all over the world, particularly from the 1950s to 1990s. In order to avoid contamination of buildings and the environment, the management or removal of asbestos requires specialist engineering controls and careful planning to prevent pollution. Survey and investigation are recommended for all buildings more than ten to fifteen years old. Greater awareness of asbestos toxicity since the 1980s has meant that the use of asbestos is being phased out. Asbestos is no longer the material of choice for most applications and controlled removal and decontamination has been a statutory requirement in many jurisdictions. However, requirements for abatement planning and operational management of asbestos are not as well advanced in developing countries. Asbestos is still present in many older buildings and has even been required as a fire and acoustic insulation design feature in recent years in some uninformed countries. Asbestos management usually entails several stages. Survey and investigation are the first step in which the asbestos specialist will check all building structural elements, fixtures and fittings for fibrous (potential asbestos materials). Samples are taken under controlled conditions and an accredited laboratory analyses the samples using polarises light microscopy. The asbestos specialist will then assess the type, location and condition of asbestos and make a hazard assessment. If the asbestos carries a high risk, an asbestos abatement plan is usually prepared to cover removal with detailed work specifications for specialist contractors. If only low risk asbestos is found operational management plans may be drawn up to enclose, encapsulate and manage the asbestos in situ. Likewise these options may be chosen for high risk materials which are too dangerous or difficult to remove immediately. In all cases the asbestos should be labelled and safety procedures instigated to prevent disturbance, until such time as it can be removed safely. Dr. Green is a Registered Asbestos Consultant. He has worked in all aspects of asbestos management and control, beginning work in this field in 1986. As a local authority inspector and registering under the Regular Inter-laboratory Counting Exchange (RICE UK) under NAMAS in 1987, Dr Green was a founding member of the London Boroughs Asbestos Monitoring Co-ordination Committee. 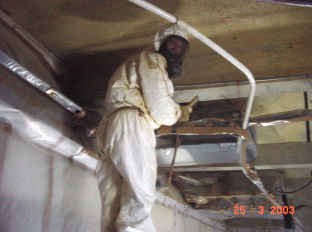 He has extensive knowledge asbestos abatement, of bulk sampling and of airborne fibre monitoring techniques for asbestos investigation and control, having conducted and supervised such operations on numerous projects in UK, Hong Kong and Asia. Dr. Green’s portfolio of asbestos assignments since 1990 is extensive (see Projects) including Hong Kong, Thailand, Taiwan, Indonesia, Malaysia, Japan, Philippines and Singapore. He has directed and managed numerous Asbestos Investigations and prepared Asbestos Abatement Plans for decommissioning of major industrial locations such as power stations, gas works, steel works, municipal incinerators, shipyards, factories, commercial and domestic premises and municipal housing blocks. A short list of major assignments is provided below for immediate reference. For a full list see Projects. Projects are grouped under Industrial, Commercial, Government / Community / Schools and Domestic premises. Dr Green’s qualifications relevant to asbestos management are listed below. · Certificate for Registration as Hong Kong Asbestos Consultant, H K Polytechnic 1993. · Founding Member of London Boroughs Asbestos Monitoring Co-ordinating Committee 1988. · Advanced course in Toxicology, St. Bartholomew’s Hospital, London 1987/88. · Asbestos Identification and Dispersion Staining Techniques, Casella, London, 1987. · Founding Fellow of the HK Institute of Environmental Impact Assessment, Hong Kong 1997. · Fellow Royal Society of Health 1986. · Member of British Toxicology Society 1988. · Member of Royal Society of Chemistry, Toxicology Group 1989 - 1993. · Associate Member Institute of Environmental Health 1990. · IEMA Approve Advanced EMS Auditing Course (Hong Kong) 2001.